The commercial-quality Star Trac S-TRx treadmill is an upgrade model from the S-TR that has added more programming plus the Star Trac Personal Viewing Screen (PVS) entertainment system. 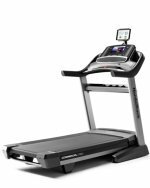 The Star Trac S-TRx treadmill has an LED console with an 8-character message window showing dedicated time, distance, incline, speed, heart rate, 1/4-mile motivational track readouts, plus MET, calories, and course profile. The 13 pre-set workouts include Dynamic Heart Rate Control, Constant Heart Rate Control, Increase Endurance, Fitness Test (Modified Balke-Ware testing protocol), and more. The Star Trac S-TRx is powered by a 3 HP direct current (DC) motor with a top speed of 12.5 mph and a top incline of 15 percent. It features a custom steel frame, 3" crowned rollers with sealed bearings, Soft Trac® triple cell neoprene rubber suspension system, and a maintenance-free and reversible 1" composite fiberboard deck. 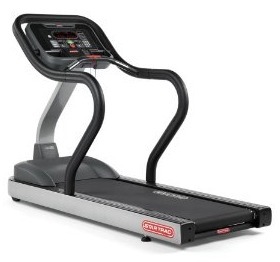 Other features of the Star Trac S-TRx treadmill include two adjustable fans, cup holders, rubber coated handrails, wrap around Aero bar, 13 programs including two heart rate control programs, and telemetry and contact HR system. At 470 pounds in overall weight, the S-TRx will need to be installed in a ground-floor home gym. The one weak issue is the 3-year warranty. Most high-end treadmills cover electronics and wear parts for 10 years and the motor for life. It is too bad Star Trac doesn’t offer the same value. The (optional) S-Series entertainment system is comprised of a 15" high definition LCD screen, NTSC/ATSC/QAM digital tuner or PAL/SECAM tuner, coaxial cable port for connecting to cable or satellite box, integrated control keypad, and headphone jack. 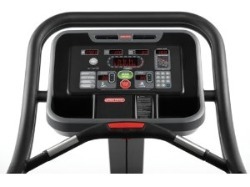 The Star Trac S-TRx model is a first-rate club quality treadmill that retails new for around $6,595. If you are seriously into training, you may want to upgrade to the S-TRc model which offers a 5 HP AC drive system for about $500 more. Do check out the different S-TR series models to get the configuration of entertainment, programming, and motor drive that best suits your needs. The Star Trac S-TRx treadmill is a true pleasure, but if you find it to be too much money to spend on a treadmill, check out the other StarTrac models, especially the flagship 4500, or the 3900, both equipped with a 2.5 HP DC motor.